Is it time for a luxury car that’s worthy of the name? The folks here at BMW of Westchester would like to introduce you to the 2019 BMW i8. To show you how this fully capable automobile can contribute to your regular drives throughout Westchester County and Yonkers, we’ve come up with this quick review. It’ll cover a few highlights in the areas of technology, convenience, and safety. Continue reading to learn more. Whether you’re looking for a great way to enjoy the driving experience even more or trying to find your way in an unfamiliar neighborhood, the i8 comes packed with beneficial technology. When it comes to entertainment, you simply can’t go wrong with such standard equipment as HD Radio™ with “multicast” FM station reception, the Harman Kardon® Premium Sound Audio System that pumps up the fun with 12 full-bodied speakers, vehicle-specific equalizing, and a thundering 360-watt amplifier. The i8 also provides you with a one-year, All Access subscription to SiriusXM® Satellite Radio to provide you with plenty of driving soundtrack options. If you do a lot of traveling for work, pleasure, or both, the BMW Navigation Professional system is sure to come in handy. Its 8.8-inch, high-resolution touchscreen gives you easy access to 3D maps and 20 GB storage for audio files. This system also makes use of voice feedback and Voice command, a navigation map with Over-the-Air updates, and Advanced Real Time Traffic Information. The BMW Navigation Professional system is also a standard part of the i8. As a luxury vehicle, the 2019 BMW i8 supplies you and your passengers with several accommodations that help to boost your overall enjoyment of the ride from start to finish. Two such features that come standard in the i8 are the automatic-dimming interior rear-view mirror and driver’s-side exterior mirror. With these, you can avoid the distractions brought about by reflecting headlights whenever vehicles show up from behind. The rain-sensing windshield wipers are also a convenient touch. These standard helpers let you concentrate on the drive itself with a clear line of sight during adverse weather conditions. The 2019 BMW i8 also comes standard with the Advanced Vehicle & Key Memory feature that remembers such things as the most recent climate-control temperature, air-distribution settings, exterior mirror and power seat settings, and radio presets. 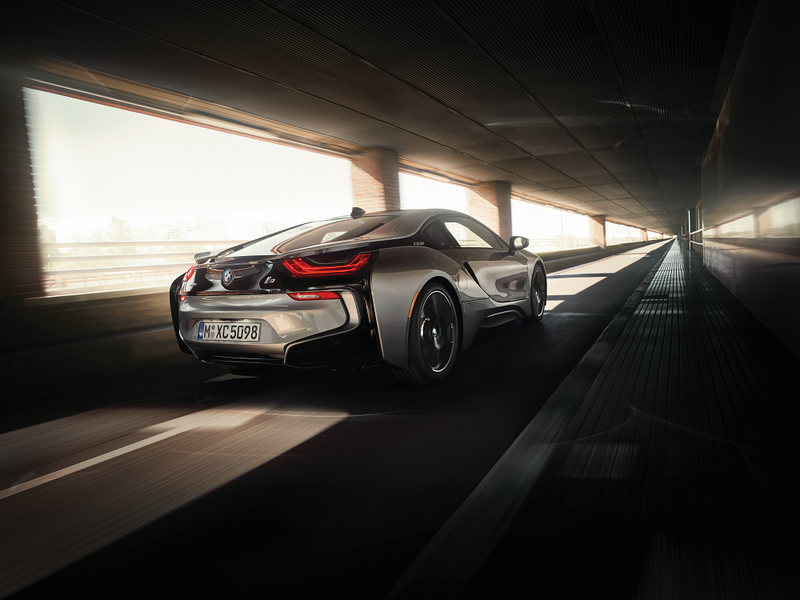 The i8 has your back if you’re ever involved in a collision. There are several standard characteristics that make sure of this. These include the BMW Assist eCall™ that comes with the Emergency Request and Enhanced Automatic Collision Notification. There’s also the Impact Sensor that activates the Battery Safety Terminal disconnect from the starter generator, fuel pump, and battery. It also automatically unlocks all doors, starts the hazard lights, and turns on the interior light. With its technology, convenience, and safety, the 2019 BMW i8 certainly has a lot to offer your Westchester County and Yonkers area drives. To experience these attributes and to find out what else it can do, get a hold of our team here at BMW of Westchester today to schedule your test drive.